A ring of metallic highlights the neck, hemline and those pretty bell cuffs. Just a touch of shimmer to ensure you'll sparkle day or night. I wear a size 4 or 6 and the small fits perfectly. Washes well and comfy as well. Just purchased another color. This is fabulous. Love the sleeves and the gold detail. Can be dressed up or down. Not a heavy sweater, which I like. I am 5'3" and do not feel I am too short to wear this. I am going to order all colors. Fit true to size for me. Diane's size are consistent. I have worn her clothes for about 10 years and the fit is always right. 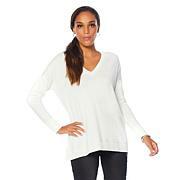 This is a very light weight sweater and more suited for transitional weather. I am always a large in this designer line but needed an xl in this sweater. I carry my weight in the mid section and found the large was too narrow and emphasized my waist line. I weigh 165 pounds. I also have to pull the sleeves up to avoid them from getting in the way because the flare is exaggerated. I think it is more suited to a tall person. This is a very pretty top. I am 4-10" and find that most of DG2 tops do not fit me well. The sleeves in this case are a bit too long. While I often will alter my clothes to fit, I didn't feel that it was worth the time and expense to have the sleeves shortened.